North of the Great Himalayan range, amongst a tangled knot of jagged mountains, lies a rugged and fascinating land, the once independent kingdom of Zanskar. Sandwiched between the Indus Valley and the main crest of the Indian Himalaya, this remote and inaccessible setting, well-guarded by snowy mountain passes, has kept alive an archaic form of Tibetan Buddhism which flourishes in chain of far-flung monasteries, most of which occupy spectacular fortified locations, high on rocky ridges in isolated valleys. Lovely high meadow camp sites and dry desert land, high passes and snow-capped peaks stunning scenery, Buddhist monasteries and picturesque villages with their irrigated fields of barley and potatoes, and fascinating encounters with the Zanskari people turn a trek in this area into an unforgettable experience. Day 01: Drive Leh - Alchi - Lamayuru - Mulbek - Kargil (225 Kms). Day 02: Drive Kargil - Rangdum (140 Kms / 7 hrs). Day 03: Drive Rangdum - Padum (105 Kms / 6-7 hrs). Day 04: Drive Padum - Sani - Bardan - Zongkul - Padum. Day 05: Drive Padum - Karsha - Stongde - Zangla. Day 06: Trek starts : Zangla - Zangla Sumdo (5/6 hrs). Day 07: Trek Zangla Sumdo - Ningrila (5150m) - NiriDoksa/ Shade Pullu (6/7 hrs). Day 08: Trek Niri Doksa / Shade Pullu - Lar-La (4850M) - Ningri (7 hrs). Day 09: Trek Ningri - Gonteng La (5000M)- Shade (6/7 hrs). Day 10: Trek Shade - Nialo Kontse Base (5/6 hrs). Day 11: Trek Base of Nailo Konts - Nailo Kontsela (4850M) - Gontunda La (5100M) - Marshun (7/8 hrs ). Day 12: Trek Marshun - Muneli (6 hrs ). Day 13: Trek Muneli - Satok Village - Tsogmetsik (7 hrs ). Day 14: Trek Tsogmetsik - Juktak (3hrs) then drive to Leh Via Taklangla or Manali. Morning after breakfast, drive to Kargil via visiting Alchi monastery, Lamayuru monastery and Mulbekchamba (9m rock curved statue of Maitreya Buddha). Today you drive on Srinagar- Leh highway till Kargil. On the way you have spectacular and magnificent view of landscape and its beautiful mountains, sometime you pass through imposing gorge and you pass across Magnetic hill, confluence of Indus and Zanskar before Nimoo village; beautiful and charming villages of Ladakh. 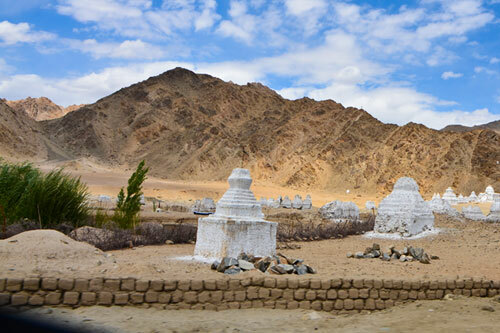 Arrive at Alchi (68km from Leh), visit the 1000 years Gelugpa sect monastery. After then continue drive along right bank of Indus River till Khaltsi village. Leave Indus at Khaltsi and continue drive on the highway towards Lamayuru. Halt at Lamayuru to visit Digung sect monastery picturesquely built on hill top overlooking the valley.After the visit continue drive to Kargil by crossing Fotula (4090m). 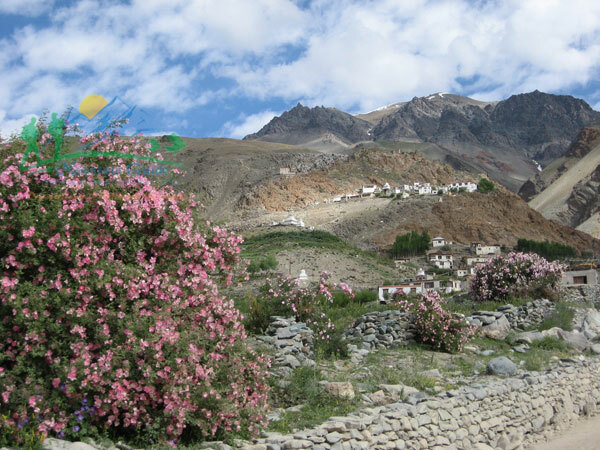 You pass through as many as charming villages as far as Kargil. Halt at Mulbek for few minutes to visit 9m high rock curved statue of Maitreya Buddha. O/n Hotel. Post breakfast drive to Rangdum monastery. Visit the picturesque monastery founded on hill top with enchanting view of the valley, by Lama GelekYesheTakpa 200 years ago. 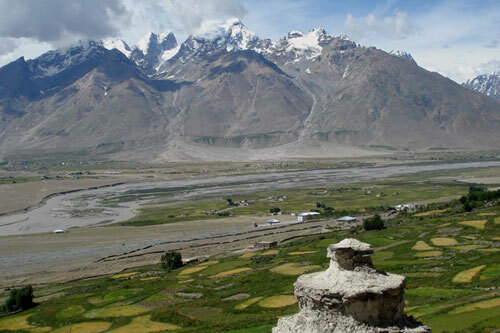 Rangdum is physically located in the Suru Valley and culturally it is part of Zanskar. From the monastery, you have wonderful panoramic view of landscape and Randum village. After then continue drive by crossing Pentsila pass (4400m) on the way. Halt at top of pass to take photo of wonderful view of landscape then continue drive as far as Padum. O/n Tents. Morning after breakfast, drive Padum to Sani to visit the most famous monastery wherein you visit the sacred statues of Buddhas and Boddhisattavas. This monastery located and picturesquely built in the middle of field and houses. After the visit, proceed to Zongkul monastery and then continue drive to Bardan monastery. 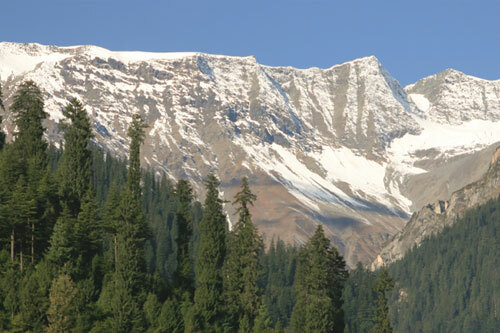 On the way you enjoy the view of beautiful and charming villages of Zangskar valley. After visiting the Bardan village and its monastery, drive back to Padum. Evening, explore Padum (the capital of Zanskar). O/n Tents. Morning after breakfast, drive to Zangla village via visiting Karsha and Stongde monastery. Karsha (Pair of White i.e., Outer white and Inner white) is 7km form Padum. Visit Gelugpa sect and largest monastery of Zanskar. The monastery picturesquely built on hill top with imposing view of enchanting valley and river, by Great Lama PhagspaShesrap (the translator of Zanskar). From the monastery, take pleasure of awesome and spectacular view of the capital of Zanskar (Padum) and its surrounding mountains. After the visit continue drive to Stongde village. Visit the beautiful monastery built on hill top, overlooking the valley, by Lama Marpa 950 years ago. Approximately 60 monks are residing in this monastery. After the visit, continue drive to Zangla. Afternoon, explore the Zangla village and interact with the villagers and evening visit a local house. O/n Tents. 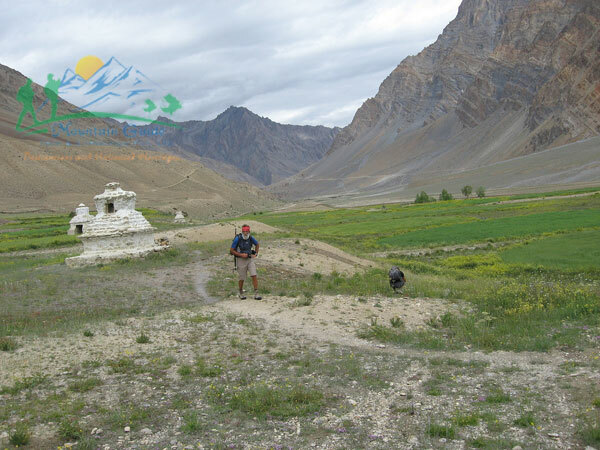 Leave camp after breakfast for ZanglaSumdo and continue the trek for half hours on the right bank of Zanskar River then turn left towards gorge. Here you cross the river which comes from the gorge several times till you reach at ZanglaSumdo. O/n Tents. Leave camp after breakfast to NiriDoksa, take left valley and start ascent towards Niri la (5150m). It will take us 3 hour to reach Niri la. While enjoying the awesome and spectacular view of landscape, you descend downwards easily for one and half hour till you reach at NiriDoksa (summer pastureland of Shade Village). O/n Tents. After breakfast, leave camp for Ningri. Follow the trek route and continue easy walk along the left bank of downstream river. Then the route gradually goes up towards the top of Lar-la. Gently ascend up for about two hours, you reach at the top. 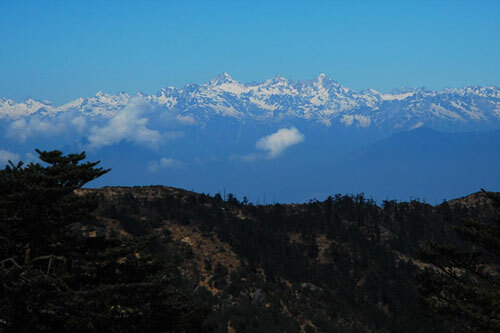 From the top, enjoy the view of imposing landscape of surrounding mountain. Cross the pass, then easy descent for 2 hour till you reach at Ningri (summer pastureland of Shade village). O/n Tents. Morning after breakfast, while enjoying the sunshine and view of awesome towering mountains, continue easy trek along the left bank of river till you reach Tantak village. Visit local monastery then keep on by crossing a river. After the river, take left route and gradually ascend up as far as Base of Nialo-Kontse-la .O/n Tents. Day 11: Trek Base of Nailo Konts - Nailo Kontsela (4850M) - Gontunda La (5100M) - Marshun (7/8 hrs ). Leave camp after breakfast start ascending till you reach at the top of NialoKastse La (approximately one and half hours of trek). While enjoying the view of spectacular landscape, continue trek by taking the left cliff of the mountain then small plans for one hour till you reach at base of Gotunda la. Ascend gradually for one hour till you reach at the top of Guntundala. 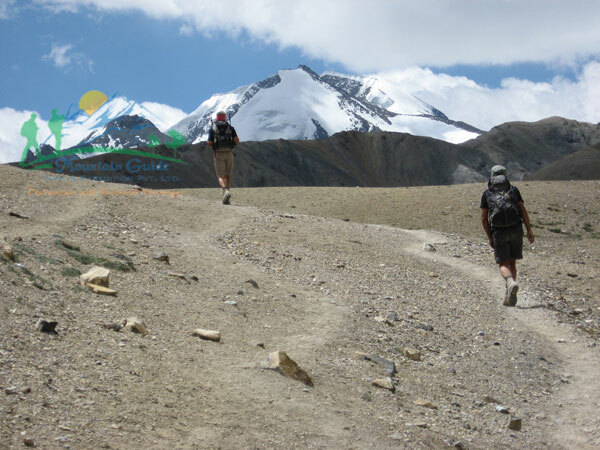 After enjoying the awesome view of huge towering magnificent mountains, descend easily down as far as camp near river. O/n Tents. As usual after breakfast, continue easy trek by taking clear route on the left bank of river till you reach at Shun Sumdo Village. Pass the village and take left bank of Tserap River till you reach at Muneli. On the way you cross Zara River which comes from Rupshu Valley. O/n Tents. Leave camp after breakfast for Tsognetsik along the Tsarap River till you reach at Satok village. From Satok, the route is going up and down. Continue along the route by crossing three ridges ridges (three small passes) as far as Tsogmetsik. O/n Tents. Leave camp after breakfast continue the trek for 3 hrs till you reach near a motor road at Tak, where you find jeeps are waiting for you to pick up to Leh. FromTak, drive to Leh via Taklangla. You cross Taklangla (the world's second highest motor-able pass). On the way you may be able to see wild Asses (Tibetan Skyang) across the TsokarLake. You have long journey on Manali-Leh highway but en-route you see several Nomadic camps, wonderful view of enchanting landscape, awesome view of mountains of mighty Himalaya and several charming villages.O/n Hotel.